Food allergies continue to increase. It is a legal requirement that any allergenic ingredients are declared on pre-packed foods, but these requirements do not apply to foods which are sold unwrapped (in restaurants, bakeries, sandwich shops, deli counters, salad bars etc). It also isn’t required of foods that are sold ‘pre-packed for direct sale’ (that’s stuff wrapped on the same premises as they are sold, such as meat pies or sandwiches packed on site). This is changing. And if you are selling non pre-packed food you have until December 2014 to comply. So what’s the score? In addition to restaurants, cafés, bakeries, sandwich shops, deli counters, salad bars etc this also applies to businesses providing food in institutional catering operations (e.g. schools, hospitals and prisons) as well as food provided at corporate events or conferences. You also need to train your staff. All staff should receive training on handling allergy information requests from customers – and that needs to happen from their first day in the job. You need to have a written procedure in place for dealing with allergy information requests and all staff should know about this. And if a customer with a food allergy asks about the ingredients in any food staff must never guess – and if they don’t know, try to find out. If you can’t provide the information say so and if that’s the case, can you provide an alternative food? A food allergy is an adverse immune reaction to a component in a food. This is not the same as a food intolerance or foodborne intoxication: it’s your immune system deciding something in a food (usually a protein) is foreign and marshalling the body’s defences against it. In some cases the body’s response is so extreme such an allergic reaction can be fatal unless quickly treated. 90% of all allergic reactions are due to allergens found in peanuts, milk, eggs, fish and shellfish, soy, and wheat. So, people with food allergies have to be extremely careful about what they eat and food labelling is very important to them. This really can be life-and-death stuff but also managing it can really impact on day-to-day life. About 1-2% of adults and 5–8% of children have a true food allergy – this equates to about 1.5 million people in the UK – and about 10 people are thought to die from allergic reactions to food each year. A food intolerance is different to a true food allergy. Usually it does not involve the immune system and is generally not life threatening. However, if a customer eats a food to which they are intolerant it can still make them feel very ill. Examples are lactose intolerance where a person lacks the enzyme that breaks down sugars found in milk or gluten intolerance where proteins in wheat, barley or rye can set off and autoimmune response. Currently the rules for pre-packed foods give a list of 14 food allergens. The list consists of cereals containing gluten, crustaceans, molluscs, eggs, fish, peanuts, nuts, soybeans, milk, celery, mustard, sesame, lupin and sulphur dioxide at levels above 10mg/kg, or 10 mg/litre (expressed as SO2). If these are present in pre-packed food (including in any ingredients used) it needs to be shown clearly on the label. (Some ingredients derived from the listed allergenic foods are so highly processed that they are no longer capable of triggering an adverse reaction. A list of exemptions was published in Directive 2007/68/EC in November 2007). Food businesses selling food prepared or wrapped on site are not currently required by law to indicate whether it contains ingredients that people may be allergic to such as nuts, wheat or eggs. This makes eating out and buying food that is not pre-packed particularly difficult for food-allergic customers because they don’t know which foods are safe for them to eat. Communication between staff and the customer (and between staff within the business) is key to ensuring that customers receive accurate information about the food sold so in December 2014 the EU Food Information for Consumers Regulation 1169/2011 will be introduced that will require food businesses to provide allergy information on food sold unpackaged, in for example catering outlets, deli counters, bakeries and sandwich bars. There will also be changes to existing legislation on labelling allergenic ingredients in pre-packed foods to ensure that all consumers are given comprehensive ingredient listing information and to make it easier for people with food allergies to identify ingredients they need to avoid. 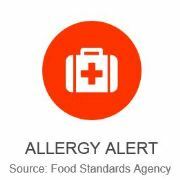 The new regulation (which was published in October 2011) will build on current allergen labelling provisions for pre-packed foods and will introduce a new requirement for allergen information to be provided for foods sold non-packed or pre-packed for direct sale. A three year transition period allowed businesses to make the necessary changes to their processes and labelling designs in order to meet the provisions laid out in the legislation – this runs out on December 12th 2014. There is an excellent FSA Guide here; it’s detailed and comprehensive. Thoroughly clean work areas, surfaces, serving areas and hands, to remove traces of food allergens. Ensure any utensils, equipment, chopping boards, and the like, that have been in contact with the food that the person is allergic to have been thoroughly cleaned with hot water and detergent. Use airtight containers to store food allergens and colour code them to make them stand out. Take steps to ensure that the area where the customer will eat the food is clean, for example, the table, crockery and cutlery. Avoid cross-contamination for example, with flour or crumbs that are easily carried from one dish to another. And above all, make sure your staff don’t make up the answer if they don’t know! Generally people with serious food allergies are pretty good at managing their condition; the purpose of these changes is laudable – it means they can get accurate information to protect themselves. But it also means they can eat out with more confidence – so chances are they will. This will be mandatory by the end of this year so the sooner you adopt a proactive approach the sooner you should see some more customers. Get in there before your competitors do!